Hello friends! I am very much fascinated by mixed media and I am always in awe when I see various mixed media projects, be it a canvas, a tag, an art journal or anything else. I’ve been secretly wanting to try my hand at mixed media projects and just get to know this style a little better. 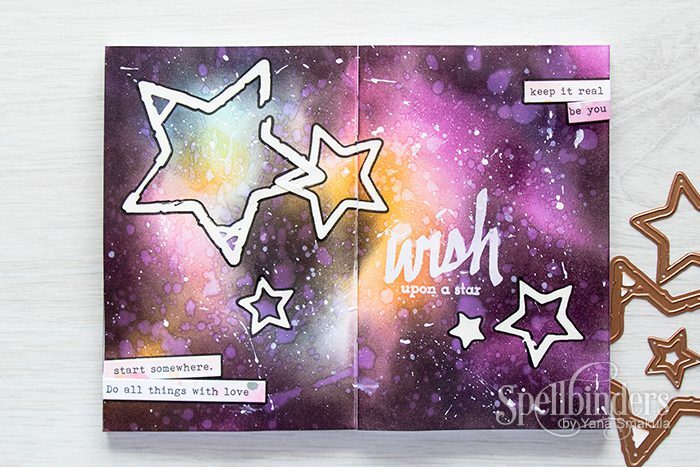 Today I’d like to share a spread I created in my Art Journal (I started an art journal for just such experiments) featuring a Galaxy Background and Robo Star dies from Seth Apter. I still have a lot to learn when it comes to Mixed Media and I hope to take a class or two at the upcoming Winter CHA’17 show in Phoenix to improve my skills. In the mean time I had a blast creating this spread for my journal. 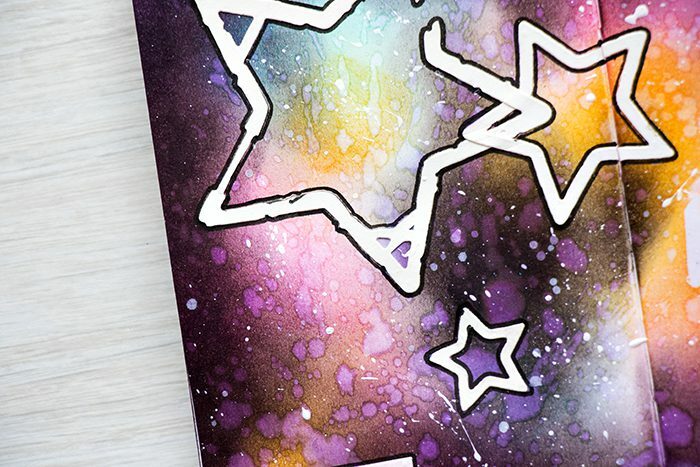 I had the chance to once again practice making a galaxy background (I followed this sample I created last January – that is a video tutorial using inks from Altenew, but you can also use Distress inks and Watercolors for this), a larger one this time, and it was really fun to incorporate die cuts into this project. 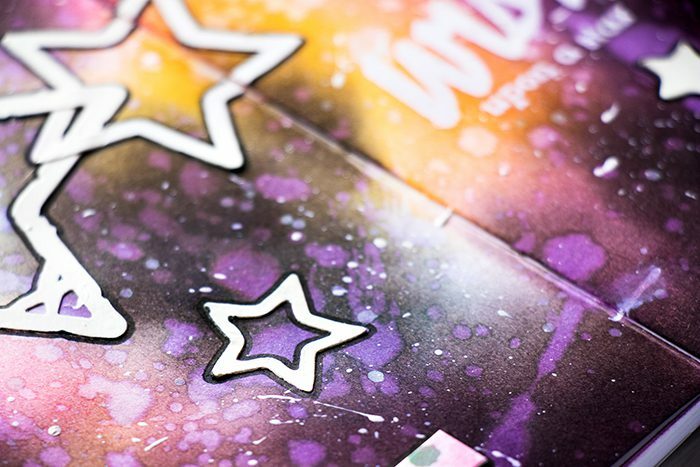 I used Seth Apter Robo Stars dies to add white die cut stars to this project. Before die cutting, I added a layer of adhesive by using Scrapbook Adhesive sheets to turn these into stickers and make adhering them onto my project a simpler task. Each star was outlined with a black pen, something I picked up from watching Seth himself, I think that really added a lot and helped these stars to stand out. As always, just beautiful, Yana. WOW! This is beautiful – thank you so much for the inspiration! I have an art journal, did one page that I didn’t like and haven’t touched it again! This inspires me to take it out again and try again!!! Hugs! Oh my, this is so beautiful,such deep rich colours. What is the brand anmeld of journal you are using? It was not listed on your products list. Wow! Art journal! Didn’t see it coming. So awesome!